By Alan Green in VectorVest on 22nd August 2017 . 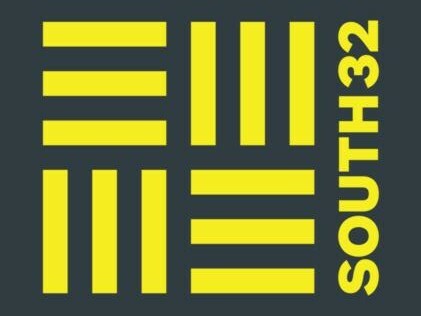 Spun out of BHP Billiton on 25 May 2015, South32 Limited (S32.L) is an Australia-based metals and mining company, operating in Australia, South Africa and South America. Operating segments include Worsley Alumina, Illawarra metallurgical coal mines in New South Wales, Australia manganese ore in the Northern Territory and Tasmania, Cannington silver, lead and zinc mines in NW Queensland, South Africa Aluminum smelters at Richards Bay plus energy coal mines and manganese ore and alloy operations, Mozal Aluminium in Mozambique, Alumina refinery and smelter in Brazil, plus Cerro Matoso laterite ferronickel mining and smelting in northern Colombia. 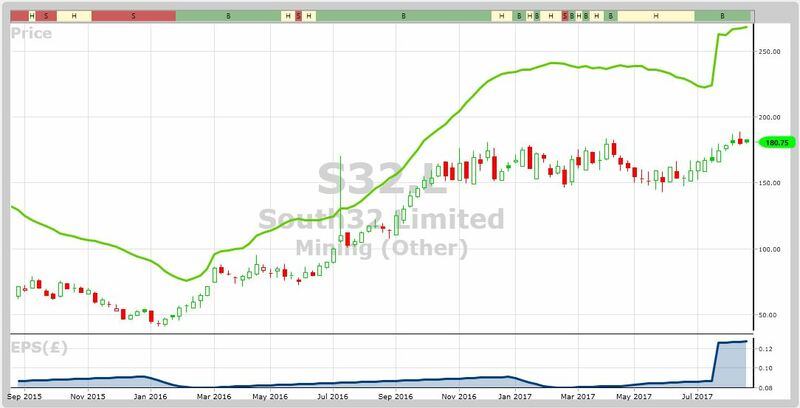 S32 has committed to return $500m of capital to shareholders with an ongoing share buyback programme. 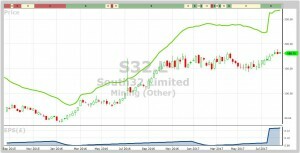 On 20 July 2017, S32 issued a Q4 report, and said it had delivered record annual production at Mozal Aluminium and stronger aluminium volumes overall. In addition, alumina, nickel and manganese operations finished the year on a strong note. CEO Graham Kerr said; “We will continue to invest in high quality opportunities where we see value, having acquired a 15% interest in Arizona Mining for $81M during the quarter. We also allocated $211M towards our share buy-back program as our balance sheet continued to strengthen.” Final results will be published later this week on Thursday 24th August 2017. The growth in S32 earnings and revenues triggered alerts across VectorVest metrics as far back as August 2016, and the stock subsequently appeared on our ‘Aggressive’ growth list earlier this year. Today, the GRT (forecasted Earnings Growth Rate) for S32 registers at 34.00%, which VectorVest considers to be excellent. GRT reflects a company’s one to three year forecasted earnings growth rate in percent per year. Added to this, the VST (VST-Vector) indicator, (the master indicator for ranking every stock in the VectorVest database), rates S32 at 1.25, which is very good on a scale of 0.00 to 2.00. VST is computed from the square root of a weighted sum of the squares of RV (Relative Value), RS (Relative Safety), and RT (Relative Timing) In terms of value, the measure of a stock’s current worth, S32 has a current value of 268p per share. Therefore, it is undervalued at today’s price of 180.75p per share. The Chart of S32.L is shown below using a weekly candlestick format over the last two years. The green line study above the price is the VectorVest calculated valuation of share while the blue study in the window below the price is earnings per share (EPS). In the last two years EPS has risen by 50% and this is the engine that has driven and continues to drive the share price upwards. The share is trying to break upwards from a rectangular 5 wave continuation pattern. The technical target as calculated by chartists (known as a measured move) is similar to the VectorVest valuation of 268p. Summary: The operational diversity and spread of risk offered by this southern hemisphere mining group highlights an attractive investment vehicle for the more adventurous investor. A relative safety VectorVest rating of 0.94 (on scale of 0.00 to 2.00) means this stock doesn’t come without some risk, but this is in our view offset by the ever growing global demand for the metals and raw materials produced in abundance by S32, and of course an ongoing share buyback programme. With the stock also paying a modest dividend and full year results published shortly, VectorVest rates S32 a buy. Readers can examine trading opportunities on S32 and a host of other similar stocks for a single payment of £5.95. This gives access to the VectorVest Risk Free 5-week trial, where members enjoy unlimited access to VectorVest UK & U.S., plus VectorVest University for on-demand strategies and training. Link here to view.